The ring brooch was the most important piece of jewellery in Norwegian traditional dress. Ring brooches can be circular or heart-shaped, and their design dates from the Middle Ages. They differ from modern brooches in the way they fasten. The wearer pulls the cloth of the garment through the central hole, and then spears it with the pin. The greater the strain on the pin, the more secure the fastening. 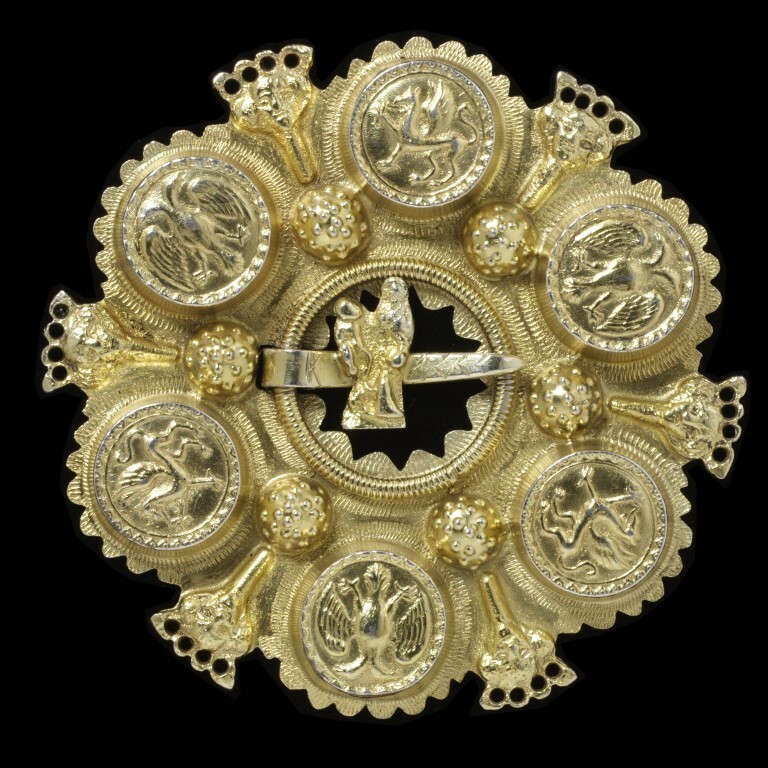 Ring brooches were worn throughout Norway in the 18th and 19th century. Their shape and pattern varied by district and use. They were worn by men, women, and children. There are well over 50 different names for brooches in Norwegian. Each kind of brooch has its own distinctive name, some of which date back to the Middle Ages. A bolesølje is a large ring brooch decorated with six raised circular mounts. It takes its name from a medieval cylindrical box, called a bole. It is unique to Norway. Brooches like this were always expensive, because of their size and weight. In the 18th century they were usually cast, but by the 19th century most were made of filigree. Bolesøljer mainly come from the south of Norway. 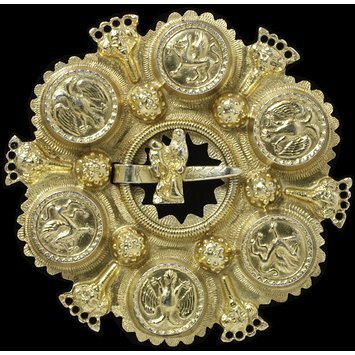 This brooch is decorated with double-headed birds and griffins, interspersed with crowned faces, probably representing Saint Olav. There is a small Madonna and Child on the pin. It probably comes from Valle, in Setesdal. It has no marks, but may have been made by Lars Bjørnsen, who made bolesøljer of this design in Kristiansund in the second half of the 18th century. It is inscribed on the back with its owner’s initials, but they are hard to read. Norwegian women frequently marked their jewellery to show their ownership. Silver-gilt ring brooch of flat sheet silver, decorated with six raised cylinders, each with an heraldic creature on the face. Between the cylinders are six domes, round the inner edge of the brooch, and six crowned faces (possibly of St. Olaf) round the outer rim. The tang is fastened into a hole in the inner rim, and is decorated with an applied figure of the Virgin and Child. Silver-gilt ring brooch (bolesølje), with a figure of the Virgin and Child on the tang, Norway, 1750-1800.